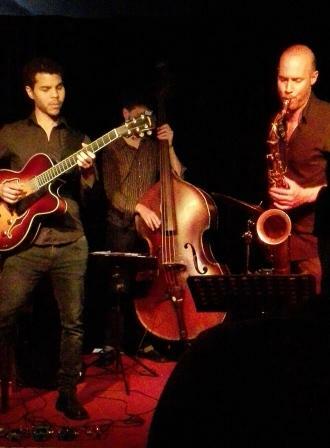 Another vibrant, well-skilled South African guitarist hit Capetown’s Straight No Chaser jazz club with his quintet made up of young European musicians. Vuma Levin has been schooling in Amsterdam and making a professional life for himself, but well remembers his own home shores as his debut album suggests. “The Spectacle of An-Other” contains his original compositions which speak messages I like: Through cultural and national identities, how do we empower marginalised Black South African histories post 1994 to integrate into various spaces and experiences without stigma or enclavist mentalities so prominent in the past? His evening at SNC drew a relatively large crowd, as do well publicized artists passing through. Levin is not just ‘passing through’ though. He participates in the Standard Bank Youth Jazz Festival (SBYJF) in Grahamstown beginning July, and will hang around our shores for a while during his study break with the Amsterdam Conservatory of Music where he’s working towards his master’s in jazz guitar performance. Informed by Levin’s facebook page promotional materials and this YouTube video: https://www.youtube.com/watch?v=WtJuVskXjc8, I queried Levin on what interested him in cultural musicology and what he meant by wanting to liberate musical forms from jargonistic and Euro-centric definitions of what constitutes ‘African music’ or ‘jazz’. My interview with him on 29 June 2015 in Cape Town caught him just before his travels to Grahamstown where, in 2009, he was chosen for the National Youth Jazz Band. Born in Swaziland from a Jewish South African father in exile with the ANC, and a Swazi mother, Levin could settle back in South Africa only after the new dispensation gave permissions for his parents’ mixed marriage. His father has acted as a DG in government while his mother worked as a consultant with the Department of Education. Settled in Johannesburg, it was only when Levin attended the Sacred Heart College and sang in the school choir that he started his musical training. At age 14, he picked up guitar, watched how buskers on the street fingered their guitars, and sang along with them. Formal musical training continued at the Tswane University of Technology where he studied with the late Johnnie Fourie for 1 year, and other noted jazz musicians. CM: You talk in the South African context about trying to salvage music from the “pre-colonial, colonial, and post colonial” periods that have marginalized black music. What do you mean by pre-colonial? VL: That’s a very hard term to define as there’s no written account of what existed in pre colonial times. That’s not to say that the only way to access history is through the written word. History can be encoded in cultural artifacts – song and dance, written items. One of the early projects of the colonial period was to try to neutralize African culture, a concerted effort to vilify it as needing ‘civilizing’, to rid the natives of their traditional practices, which were central to dispersing history through oral means, etc. This effectively limited access to this history. At the end of the day, the pre colonial history is hard to define as we don’t have access to it, unless we can salvage something of the traditional. From the Euro centric standpoint, which looks to written history, there’s none of that in African precolonial life. CM: When you go to the colonial period, what do you consider ‘colonial’ music? VL: I consider that music basically from 1652 onwards , when the first settlers arrived and settled, up to 1994. Obviously, that’s a very broad category with a lot of different phases but for me, that is what the colonial moment is for me. CM: Something came out of that colonial period? VL: Yes, basically what was key was the interaction between new colonial settlers and the people already living in southern Africa, or the indigenous peoples. This interaction took hold particularly during the time when King Shaka was defending and conquering lands or borders of expansion. With this increased interaction, between various ethnic groups within South Africa, you develop a trade in culture, sometimes imposed, like with the Christian missionaries. Sometimes it’s more organic and fluid. The key thing is that whether art forms are forced or organic interactions, they change, even artificially. Even in the 1980s you had your Winston Mankunku’s and Chris McGregor’s travelling with their music in Europe, so there was that exchange. And the effects from these exchanges are different at every stage of history. CM: What about the present? VL. Post-colonial? Imbedded in the term is the understanding that even though formal colonialism has ended, the power relations which colonialism inculcated in us are so very much in existence nowadays. CM: Power, yes. There is now a majority power in this country. Do you think the cultural and musical art forms of that majority are coming alive? CM: Talk more about Carlo Mombelli and your experience or influence with him. I don’t see Carlo as being terribly ‘indigenous’ although you have dedicated a composition to Carlo. How would you describe his influence on you? VL: For me, Carlo was a very early influence. I listened to his music and was inspired at a young age. It’s important to realise that terms like ‘authentic’ and ‘indigenous’ are dangerous terms to use in South African context . The moment that a South African subject takes something from the outside world and uses it in a non-reactionary way to express themselves, it becomes a ‘South African’ thing. So English, and French, and Portugese – all these languages are African languages. They’ve been appropriated by people here and used as a way of articulating their sense of self, and I consider this the same way with music. I consider Carlo’s music as authentically South African as would be a Xhosa composer. They are both citizens of this country appropriating something from the outside and using that as a means of expressing what it means to be a South African for himself, and in an organic way. CM: Carlo’s stay in Germany perhaps meant he absorbed other influences, but maybe his own infusion of African-ness in his music might not be seen by European listeners in quite the same way as he would have liked. VL: It’s basically about demystifying Africans because from the European standpoint, there’s a mystery about what it means to be ‘African’. CM: Which is what Kyle and others are trying to do. Which brings me to your role in trying to demystify this African-ness. This is an important part of your workshops here, to try to correct people’s gahgah about: “Oh, here’s our boy coming back home to his roots” type of response from people. We all are born somewhere, but this doesn’t mean we have to get stuck in our ‘roots’. I have your quote I’d like to clarify: ‘denigration of historical and contemporary South African music’…… What did you mean by this? Isn’t the world trying to bring back this older music of another time? VL: Well, I think there is this effort to bring it back, but the way it is done is highly problematic. Since Edward Said wrote “Orientalism”, terms such as exoticism and primitivism have entered the cultural lexicon, and people are not sensitive to the fact that they are largely engaging in these practices when they try to empower African forms, basically. So the idea is: If you’re going to book an ‘African band’, already you may have a preconceived notion of what constitutes an African band. You know how to market that. And if anybody falls outside of that strongly preconceived notion, you’re less likely to market them. For instance, how do you market somebody like Bokani Dyer whose music draws from jazz pianist Robert Glasper who doesn’t play African art forms? There’s an alliance between capital and the colonially inherited notions of what constitutes ‘Africans’. It is only fair that those people who continue to engage in these traditional practices, and who have been marginalized in the past, be given space to do their thing. CM: So ‘traditional’ doesn’t always mean ‘in the past’…? VL: Traditional artists themselves are often a lot more nuanced with contemporary sounds and narratives than people think . They’re human beings so can carry messages…. It’s a bit de-humanizing to have this preconceived package of beliefs about who they are. So this is an essential feature about what my project is about. These go hand in hand: nuancing African identity and empowering marginalized histories. It is a contradiction because on the one hand, you’re saying there’s no such thing as traditional African-ness, and on the other hand, there IS such a thing and we need to empower that. It’s a necessary contradiction to draw in. CM: The contradiction helps to empower through debate by providing that debate. It requires a sense of history and social propriety and intelligent debate, doesn’t it? CM: You have on the one hand local South African influences with people who reside here, whatever the expansion of their music art form is. Some are moving on with their sound forms; others are still stuck with what they know best and in the past. Then you have the ‘diasporic’ influences. Who are these Diaspora you speak about? VL: I think one definition of ‘Diaspora’ is a large body of people who move from one part of the globe to another. Diasporic musicians can include Africans who have left their African areas. This doesn’t only include musicians but the Africans carrying their intellectual diasporic traditions, like Chinua Achebe, Kofi Agawu (a Ghanaian musicologist). But I’m referring also to the music itself, especially in the age of globalization, there’s increased motion in music. It’s moving around, and again allied to capitalism, not knowing really where the music is coming from. When I was 13 years old, I listened to Radio Head and Massive Attack – that was my music foundation and the music I loved most. So this was diasporic music, which doesn’t only refer to Africans moving about. CM: That’s an interesting concept of migration, of people migrating without being ‘migrants’. We all are migrating in our social, cultural, and intellectual forms because there’s a world of information out there. This is great. But it’s also overload. People are getting confused – about what they’re hearing, etc. And terms we use are not catching up with the informational overload we’re experiencing. If you have terminologies that are not catching up, then you get stuck with jargon which influences people’s psychology, and the informational ‘box’ effect. But this is just human nature, isn’t it? CM: How do you break through this? It’s interesting your European band is playing a type of sound you’re trying to cultivate. VL: The musicians are craftsmen and creators in their own right. The music I compose has such a strong basis in western harmony, just to be publically clear. I consider myself to have been very well colonized in that regard. My ears are very oriented to western harmony and because we all speak in this western harmonic language it becomes possible to compose songs and interact on that front, particularly with that jazz tradition , from Parker and bebop to contemporary modern jazz up until now. Secondly, we have a shared harmonic language that comes out of the classical music tradition and has been elaborated upon by various jazz artists. Because we have these common points of reference, it makes it possible for us to engage in the conversation. CM: Good point….common points of reference. Are you planning on returning to South Africa more permanently now? VL: If you asked me this two years ago, when I was finishing my degrees, I would have said, yes, I’m coming back. But with professional obligations, and with things happening in Europe to my favour, I would say, yeah, I’ll come back at some other time. I would try to set up some trans-continental arrangements in the meantime. CM: If you were to spend time in South Africa, what would you want to do here? VL: One has to be realistic about establishing networks and business outlets. I would be very interested in working with local musicians. I would also love a job teaching at a University, and having private students. In Europe, I’ve been lucky with several gigs per month. The band, Aurelio Project, led by a Mozambiquan, has included me in their tours. CM: Who influences you in your improvisations? Who do you look up? VL: Carlo, Marcus, Africa Mkize, John Davis, Kevin Davidson, Massive Attacks, Debussy, Ravel and other classical music. 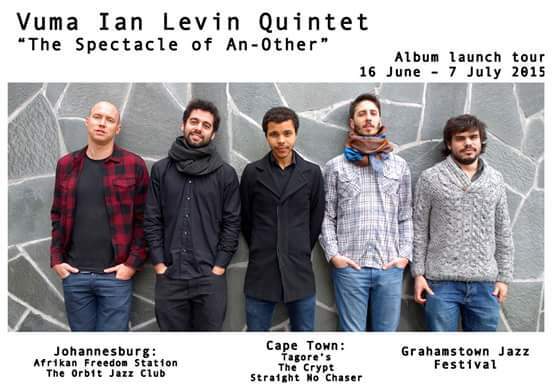 The atonality of Schoenberg…..
Vuma Levin plays at the Grahamstown Youth Jazz Festival and also at the Fringe venues. His quintet includes Bernard van Rossum (Tenor Sax, Spain), Lennart Altgenug (Piano, Germany), Marco Zenini (Bass, Italy) and Jeroen Batterink (Drums, The Netherlands).